Pogba to Juventus in January? 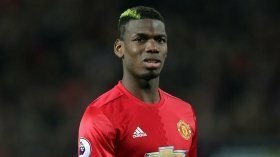 Italian giants Juventus are reportedly prepared to make a January approach to re-sign unsettled French midfielder Paul Pogba from Manchester United. The France international rejoined the Red Devils from the Bianconeri in the summer of 2016 and he has since made over 100 appearances in all competitions for the club. Despite this, his future has been a regular discussion point with his strained relationship with manager Jose Mourinho and Tuttosport suggests that the Frenchman could make way from Old Trafford at the turn of the year. It is added that the Serie A champions are prepared to make an offer of around £72m for their former midfielder, although that would still remain short of the £89.3m spent by United in 2016. Pogba currently has more than two years remaining on his existing deal with the Red Devils and it appears highly unlikely that he would extend his stay with the club so long as Jose Mourinho remains in the dugout.